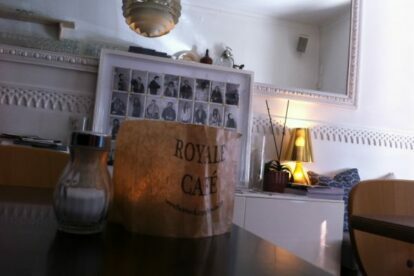 Royal Café is a nice, almost hidden place to have breakfast, lunch or an afternoon snack. The setting is modern and clean, without being distant. In the back you can find a (rather tiny) terrace. The main specialties are natural- and organic products. They have a good assortment of salads, sandwiches, fresh juices, various teas and infusions. Their hummus is great, served with pita bread. I am also quite a fan of their hamburger. It is not cheap, compared to your average Portuguese pastelaria or snackbar, but nothing scandalous, especially if you’re used to Northern European prices. I like to come here to have lunch or a snack when spending time in Chiado. It is just 100 meters away from the main street in Chiado, but a lot more quiet and less touristic. The whole is square is now redeveloped and has been transformed into one of Lisbon’s delightful little corners. If it is full try Vertigo.